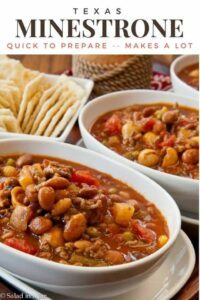 Easy Texas Minestrone Soup is a spicy version of minestrone that I like to call a “can-opener soup.” Leave the ground beef out for a hearty vegetarian meal. I’m not too proud to admit that preparing this recipe is going to require a can opener. Are you surprised? You shouldn’t be. Anybody who will eat chopped romaine lettuce stored in a vacuum-packed Mason jar every day for lunch obviously doesn’t need gourmet food at every meal. There are those days. Surely you have them, too. Sometimes you just don’t have the energy or motivation to cook a nice meal. Typically, I prefer to throw something together at home rather than eat out, even if it’s not fresh and/or fancy. Yes, I know. Canned beans, canned vegetables, and condensed soups often contain too much sodium. On the other hand, they usually have fewer calories and more nutrition than food from the local drive-thru. Thanks to my friend Joan who gave me this recipe. Easy Texas Minestrone is a cool-weather staple at our house. It is the perfect candidate for my new “Super Simple Suppers” category. All the ingredients can be stored in the pantry and/or freezer, making it easy to keep on hand. If your family is small, you could eat it for days. Thankfully, it freezes well, so you have that option, too. Brown ground beef in a large pot. Drain excess fat if necessary. Add onions and cook until softened. Stir in remaining ingredients and simmer for 20-30 minutes. did you drain the ranch beans or use the juice? Can I use minestrone with Italian sausage? Made this last night, but didn’t want to eat leftovers for 3 days, so I omitted one can of minestrone and the can of diced tomatoes. It turned out great, and just the right amount of leftover soup. Our family does not like a strong tomato base anyway, so the one can of Rotel was just right. Take care of my kids tonight! Soaking/boiling beans is a pain in the arse. I always use canned, without shame! So isn’t this a coincidence: I am looking for a good can opener, an electric one, I’m always scared of cutting my fingers on the lid and my birthday’s comming up. I know what I’ll be getting! That does look like on hearty minestrone! Thanks for the unsolicited review of the can opener. We still use a manual one but have been looking for an electric lately. I like the look of the sleek lines of this Hamilton Beach and the fact that you’ve been using it for years with no problems! Paula, I don’t have the Hamilton Beach can opener. I do have a hand held Tupperware can opener that cuts the lid the same way! I love it! I did not realize Tupperware had one. Is it electric or manual? I have a manuel can opener that I purchased from Wal-Mart 8 years ago that does the same thing. Thankfully it is still working like a champ! Thank you for the new recipe! In my neck of the woods, we just got past some really nasty weather and lots of folks were without power for several days. So, it is a wise and good thing to be able to prepare a few meals (that also taste good) from canned foods. So whether it’s a time crunched day or a day without power, it’s good to be prepared! So glad you brought up the preparedness issue. This is a perfect recipe for that. If you leave out the meat, it can all come out of cans. 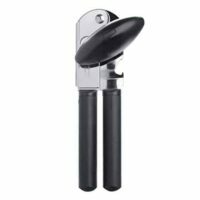 And I just had to add that although many kitchens enjoy electric can openers, always have a manual one as a back up to be able to open cans in a power outage. For throw it together meals, I sometimes use the canned beef from Costco. Haven’t seen it anywhere else, but it is just chunks of beef in broth packed tightly, sort of like they do canned chicken. 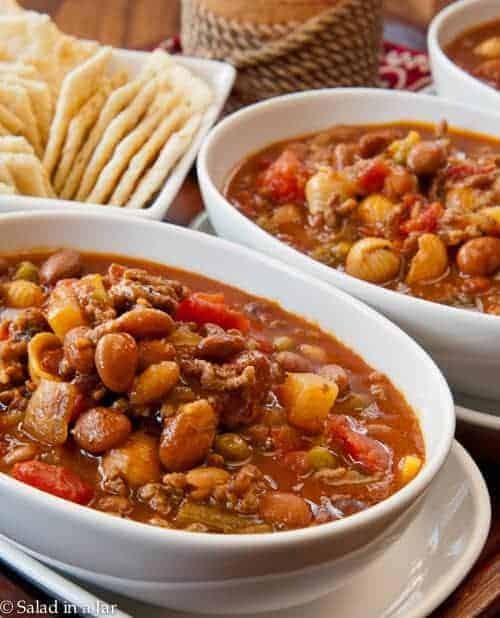 Makes a good pantry staple and good chili mixed with canned beans and tomatoes. I have canned venison, both ground and cubed. It worked well, but the pressure canners needed are large and pricey; and the time involved is considerable. If you try canning meat you need to use the latest USDA or Ball canning books and follow their instructions. I have the same can opener. I had been jealous of my daughters for a couple of years and she gave me one for Christmas. I absolutely love it. Yummy recipe, thanks for sharing. I’ve been wanting a “pantry” minestrone recipe. Just FYI, the can opener doesn’t cut the can, it breaks the seal, leaving no sharp edges. I have a hand held model that I love. Very interesting comment about the can opener. On the Hamilton Beach website, it says “No more sharp lid edges—cuts can along the side for smooth, touchable lid.” But I am incline to believe you are right because sometimes, I can see (barely) the glue strands as I pull the lid off. Maybe the company says it that way so we can relate it to other can openers. Thanks for writing. That is an amazing can opener. The minestrone looks great. Easy is good! 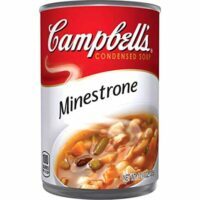 Oh, I have no problem using pantry items especially when the finish result looks as good as your minestrone!